December 16, 2003 · 10:00am-12:00pm · Washington, D.C.
Deputy Secretary of Health and Human Services Claude Allen hosted a town hall meeting to highlight the important role of health promotion and disease prevention activities in ensuring the health and wellness of one of long-term care's everyday heroes -- our nation's family caregivers. Family caregivers are a critical source of care to older persons with disabilities and chronic health problems. The unpaid and informal care they provide is an essential source of help for disabled elders in the community. If the work of family caregivers had to be replaced by paid home health care staff, research shows a significant cost to the nation of $45 billion to $94 billion per year. It is generally recognized that caring for an older person with a disability or chronic condition is burdensome and stressful to many family caregivers and contributes to psychiatric and physical morbidity. Accordingly, about a third of these caregivers describe their own health as "fair to poor." Recent research findings suggest stress associated with family caregiving can result in increased risks of infectious diseases, such as colds and flu, depressive symptoms, and chronic diseases, such as heart disease, diabetes and cancer. Family caregiving, when accompanied by emotional strain, has also been found to be an independent risk factor for mortality among older adults caring for loved ones. Researchers have also shown that family caregivers are less likely than peers of the same age to engage in health-promoting behaviors that are important for chronic disease prevention and control. Given that the demands of caring for a loved one may compromise caregiver health and functioning and increase caregivers' risk of developing physical health problems, there is a pressing need to encourage family caregivers to engage in activities that will benefit their own health, well-being, and longevity. speak on the importance the Department places on encouraging the health and well-being of America's caregivers. Mr. Donald "Mac" Showers, Ms. Katryna Gould and Mr. Bill Kays, who are former and current caregivers, were on hand to deliver testimonies of their caregiving experiences and also, discuss the positive impacts that health promotion activities have on their quality of life with Deputy Secretary Allen. It is necessary to care for the caregiver as it is to care for a loved one. Get adequate rest and exercise. Acknowledge your own poor and adverse health. Do not ignore your own health. If you do not take care of yourself, in the long run, you will not be able to be a good caregiver for someone else. Recognize when you are no longer able to care for your loved one. Do not be ashamed to ask for help. Seek balance in your life as a caregiver by taking time out four your own needs and interests. Consider joining a support group. Such groups can be extremely valuable in providing a safe place to share personal experiences and feelings with others who are in similar circumstances. Barriers to health promotion activities may include lack of time, respite care, depression, guilt and denial. Use the opportunities when taking a loved one to the doctor to address concerns and/or ask questions about your own health. Prevent adverse health by getting immunized and obtaining routine screenings. Also be mindful of your own nutrition. Do not try and do everything by yourself. Ask for help from others and utilize local resources, such as the Eldercare Locator at 1-800-677-1116. Quality respite services can allow family caregivers to have a break from their current pressing challenges and give them some much needed time to themselves. 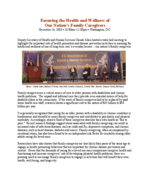 NOTE: PDF versions of all Caregiver Event material is also available from http://aspe.hhs.gov/daltcp/reports.htm, or Hard Copies can be mailed to you by emailing your request to webmaster.DALTCP@hhs.gov.